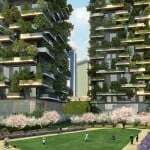 Besides the fact they provide almost everything that both humans and animals need to ensure existence, trees signify that the earth is the only planet that can sustain life because of the clean air that we breathe. This has been one of the reasons why ever since the dawn of time and the start of human civilisation, trees have been revered as sacred beings, as well as dwelling places for gods and goddesses. How trees stay alive for thousands of years by making their own food out of sunlight, getting the nutrients they need out of the ground, as well as having the ability to reproduce on their own by means of the falling leaves and branches. May well be one of the greatest wonders of nature. This is one of the reasons people in ancient times looked upon them with such awe and worship. Almost in all cultures of the oldest civilisations, trees have been a focal point of worship. Before there were temples and churches, people made forests a place to praise and worship their gods. Many kinds of different apparitions have been recorded to take place in numerous places all over the globe. Yet it has always been associated to have happened around a particular tree throughout the history of human religion. Even with today’s modernisation, these so-called “sacred trees” are still being given the utmost significance and value, perhaps by both believers and non-believers. Not only do they represent a great part of most cultures’ history, each and every one of these sacred trees is older than any human that has ever walked the earth. This only adds to what makes them so precious and mysterious. 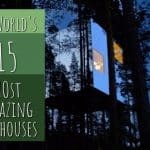 Below are 11 of the most sacred and iconic trees that are absolutely worthy to be adored and treasured by anyone. Despite the belief that the Baobab tree is where ancient spirits reside, people of Madagascar also believe that this beautifully enormous tree is the place where spirits of dead family members linger. It’s a common scene to witness people of Madagascar give all sorts of gifts, such as honey, wine and archaic money as offerings left around the trunk of the tree with a white or red piece of cloth as their way of paying respects to their ancestors. Probably one of the reasons why this tree is so important and sacred to the people of Madagascar is the fact that a Baobab fruit contains an anti-ageing nutrient called polyphenol and is also extremely rich in vitamin C, fibre, and calcium. With this, it is also believed that the fruit provides great aid in boosting one’s immune system as well as an aid in digestion and skin, hair, and nails’ rejuvenation. During the height of the Holy Roman Empire, a Tanzlinde or dance tree has been utilised as a judicial courtroom. As well as a place where assemblies were made and called Gerichtslinde (German for “court linden, doom linden”; plural -linden). With the fall of the Roman Empire and the spread of Christianity, the linden or dance tree remained as a symbol associated with security and justice. Because of Christianisation, it has then been re-devoted as a symbol of the Virgin Mary and of the 12 Apostles. This tree is perhaps one that has the most detailed sacred significance of all. Buddhist’s believe that it is under this tree where Buddha himself sat down some 2,400 years ago and meditated for four straight nights, known as The Four Watches of the Night. This is supposedly what lead Buddha to enter Buddhism’s version of heaven – Nirvana. Because of this belief, Bodhi Trees serve as a sacred temple Buddhists use to meditate and worship their god. A couple of these are located all over Thailand. The most famous perhaps is the Bodhi tree with a sculpture of Buddha wrapped around the tree’s roots as if it miraculously grew with it. This is located at a monastery in Ayutthaya, Thailand. Standing alone like a secluded monument over the countryside. The Holy Thorn Tree of Glastonbury in Southern England is one of the several famous pilgrimages of Christianity. As the legend goes, it is believed after the crucifixion, Jesus’ uncle, Joseph of Arimathea, travelled with the Holy Grail (Jesus’ wooden staff) and had stopped to get some rest at the Wearyall Hill. Here, it is said that the tree unbelievably sprang out of the wooden staff the following morning. The original miracle tree from Jesus’ wooden staff was unfortunately cut down at the time of the English Civil War. However, some specimens from the original stock have been planted as a replacement to ensure the continuity of the sacred tree. 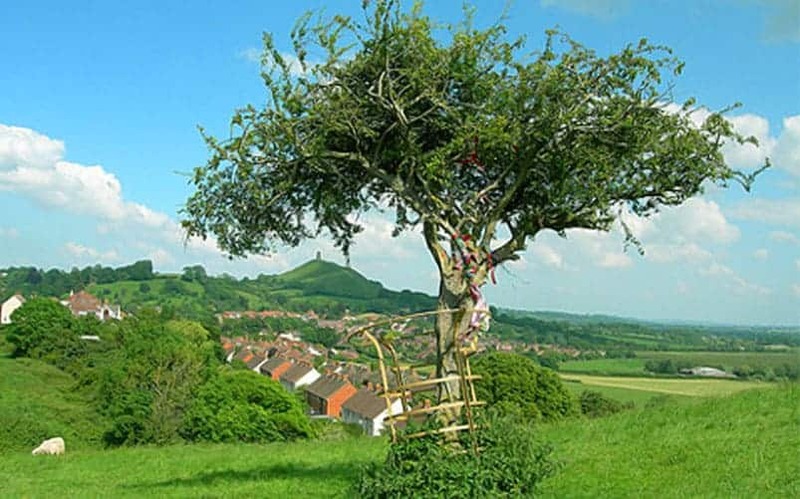 Perhaps sacred status is the fact that these thorn trees found in Glastonbury only bear flowers twice in a year and this is during Easter and Christmas, which are 2 of the most important events in Christianity. Due to its utmost holy significance to Christians and especially those in England, a twig from one of these thorn trees are cut and sent to the royal family every winter. The Lone Cypress Tree does not really symbolise a sacred dwelling place for spirits of another world like those that preceded it on this list. 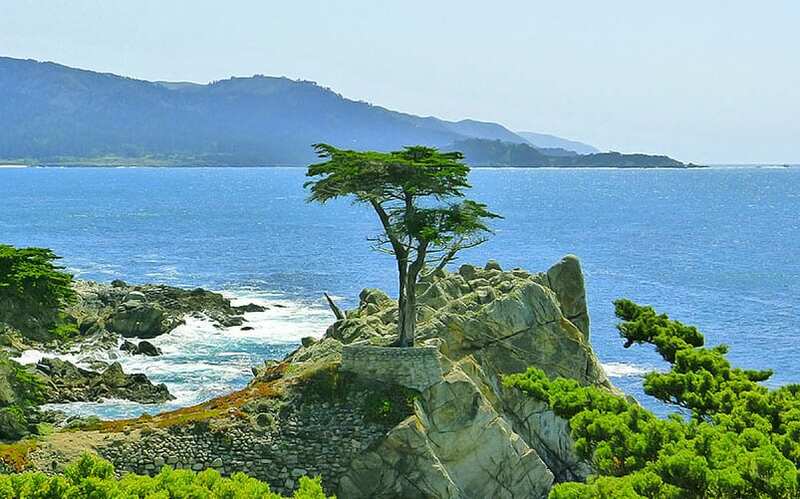 However, due to its 200-year existence, as well as the fact that it seems to have grown on its own on a rock hill along the 17-Mile Drive on the coast of Pebble Beach in the State of California. This tree’s mere existence is miraculous, making it an iconic marker on the said State. Perhaps no one can deny that the mere sight of this tree, standing somewhat like a guardian of the sea and other trees below it, is absolutely a jaw-dropping. Guaranteed to turn whoever’s head passes along it. 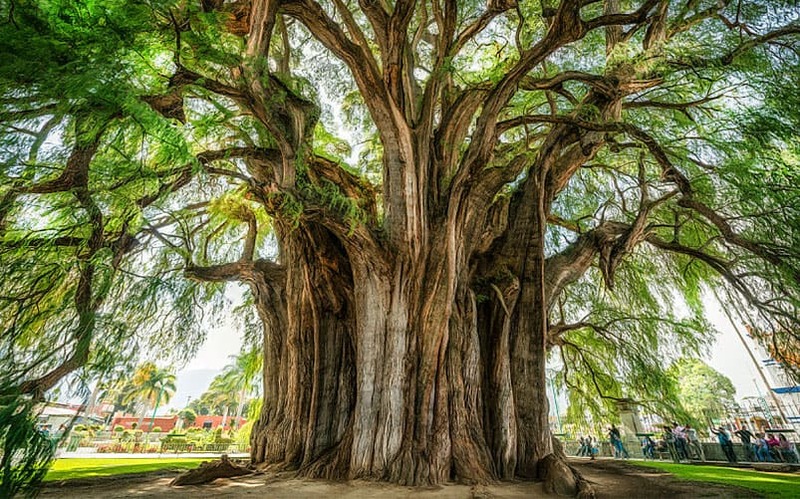 The Tule Tree of Mexico is one of the most iconic tourist trees located in Santa Maria del Tule, a small town in the humble state of Oaxaca, Mexico. Like the Lone Cypress Tree mentioned above, this tree does not have a sacral background attached to it but it is sure to surpass all other trees on this list in terms of its size and mass. This colossal tree measures more than 160 feet in circumference with a staggering weight of 550 tonnes, making it the largest living tree in the world. Unlike most of the popular myths and legends where giants are easily taken down by their small foes, this massive tree is almost 3 centuries old making it also one of the oldest living creatures on earth. It is located near a church in Santa Maria del Tule where hundreds of locals and visitors come every year to witness its awe-inspiring size. It is believed that there are only seven of these enormous trees known to be alive today. And are all found in Mexico making it their national tree. 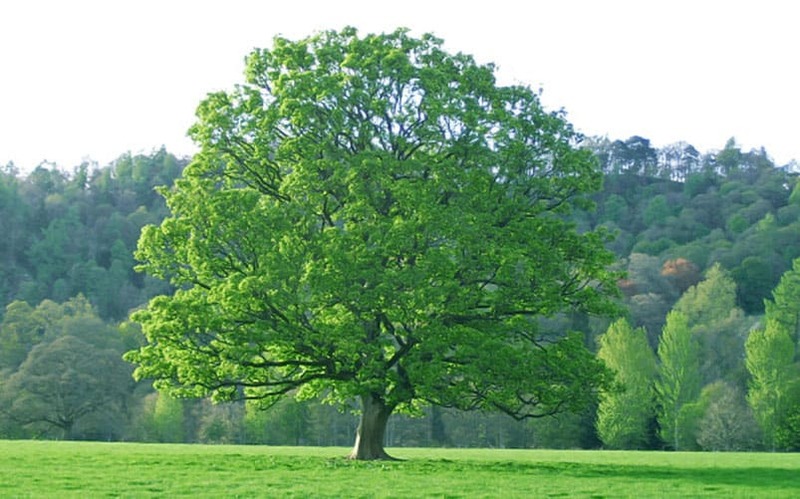 The word “oak” itself is connected to the word God (el) which are allon and elon in Hebrew. This almost 5,000-year-old tree is allegedly located in the exact place where God and his angels appeared and talked to Israel’s founding father – Abraham. It is believed that it was under this tree where Abraham received the news of him having a child which was then named Isaac. Although it has been reported that the original stem has long been dead since the year 1996, an astonishing sign of life sprouting out after 1-2 years provides great hope for most Christian’s who find this tree so sacred. Again, the Bristlecone Pine Tree is not revered by any culture as sanctified or something of a blessed nature. However, this tree is known to have the capability to exist in excess of 5,000 years. It could perhaps be labelled as the “immortal tree” simply because of its longevity. You might think that the long-life span is because it thrives in the most comforting places, but that is a myth. Bristlecone pines grow in places with high altitude, almost 10,000 feet to be exact. 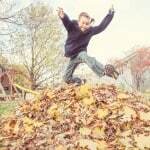 Temperatures can also reach below freezing point. This is just one reason why it is bestowed with such mythical proportions. Humans and some animals are also capable of existing in places with such extreme climate, however, Bristlecone pines are known not only to survive the coldest of temperatures but also to surpass their own survival rate. This type of tree is extremely resistant to all natural invasions that may cause all other species of trees to rot such as fungi and insects. 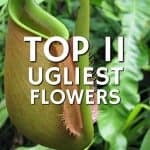 In fact, they are believed to still be rooted on the ground and can live for hundreds of years even if they become somewhat biologically dead. 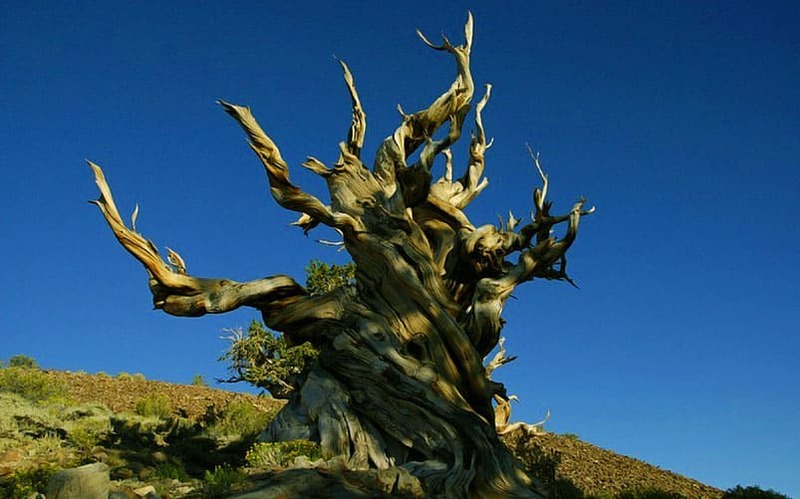 The oldest of the Bristlecone Pine trees ever discovered, was believed to have amazingly existed for 5,062 years and counting. “Methuselah” is the name given to another one which was discovered in the White Mountains which is believed to have lived for 4,843 years. The third tree which was nicknamed “Prometheus” is said to have existed for about 4,862 years and was cut down by a geologist looking for physical proof of Ice Age glaciers. From the Greek word “Sicon” meaning fig and “moros,” meaning blackberry bush. 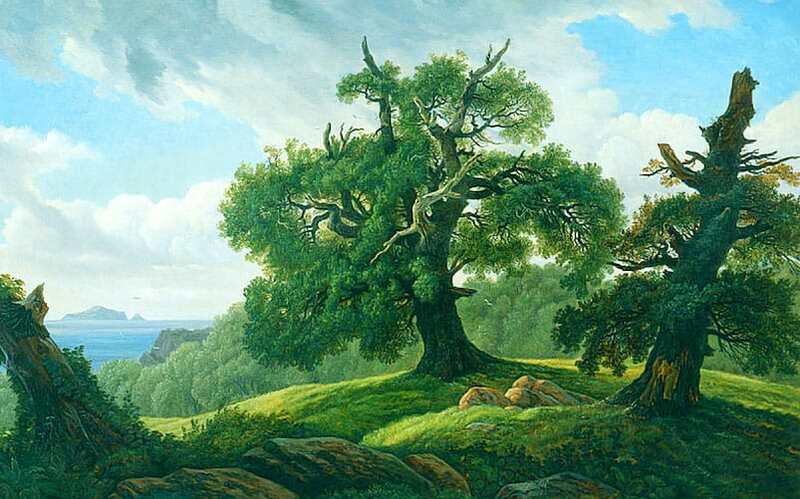 The Sycamore Tree is perhaps the most mentioned species of tree in the Christian Bible. From the time of King Solomon (Old Testament) up to Jesus’ time (New Testament). 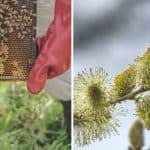 Despite numerous Bible citations, it does not really merit any sacred symbolical meaning unlike the other species of trees mentioned in this article. Perhaps instead of defining the Sycamore Tree as a pilgrimage for worship, the real and deeper meaning that it could best serve is the additional sense of factuality of the Bible itself. As a natural and scientific fact, from all known species of tree, the Almond Tree is the first to grow its leaves and the last to lose them in Autumn. Like the Sycamore Tree, it has been mentioned several times in the Bible and specifically in Books of the Old Testament such as Exodus, Genesis and Jeremiah. One of the most important religious events for Christians is the Lenten Season that lasts for 7 days, also called the Holy Week. This commemorates the last days of Jesus Christ, focusing on the night in which he was captured untilill the crucifixion and resurrection, popularly called Easter Sunday. The Lenten Season starts on a Sunday as well and is known as Palm Sunday. This particular event in Jesus’ life is the reason why Palm trees, specifically its leaves, become a religious symbol. As written in the New Testament, Jesus, together with his apostles, visited Jerusalem and was greeted with a grand welcome by the locals who put palm leaves on the ground as Jesus passed through Jerusalem. Nowadays, Christians all over the world do the same thing as a remembrance to this event, and by attending the Holy Mass with palm leaves which will then be blessed by the celebrating priest. Palm leaves have become a religious icon which signifies the start of one of Christianity’s most sacred events.